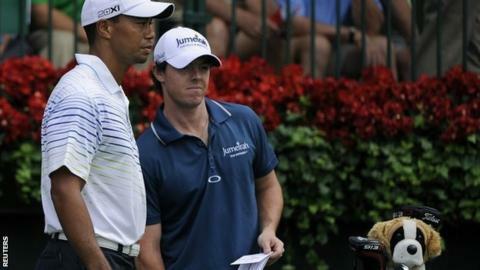 Tiger Woods and Justin Rose share the lead on four under after round one of the PGA Tour Championship in Atlanta. Englishman Rose sank a 50-foot birdie putt on the last to set the clubhouse lead, while Woods, playing in the final group, had six birdies in his 66. Four Americans are one shot back while Northern Ireland's world number one Rory McIlroy, who has won three of his last four events, hit a one-under 69. Lee Westwood had eight bogeys in his round, but escaped with a two-over 72. The Englishman's rollercoaster round began with a couple of birdies but four bogeys in his next five holes threatened to wreck his tournament. In an unusual round, that contained just four pars, the world number four mixed four birdies and four bogeys in his closing 11 holes. Despite the final tournament in the FedEx Cup play-offs featuring the top 30 players, most eyes were on the final pairing of Woods and McIlroy, both of whom know that victory this weekend will give the winner the $10m (£7m) bonus on offer. Woods had three birdies and one bogey on both his outward and inward nine, although he missed a 13-foot putt on the last that would have given him the outright lead. However, the world number two was satisfied with his round. "I played well," he said. "It was a very consistent round. I hit the ball well, made a few putts, got around well." McIlroy also had a couple of bogeys in his round but he could only muster three birdies to finish three shots off the lead. Englishman Luke Donald had a steadier round, although he picked up his third bogey of the day on the 18th to finish on one over. Scott Piercy also found the last troublesome. The American led on five under but double-bogeyed the par-three hole to finish alongside compatriots Bo Van Pelt, Matt Kuchar and Steve Stricker on three under. To win the bonus money, Piercy, who went into the week in 30th place, would need to win and hope McIlroy finishes 30th. "My chances are slim to none," he said. "I think slim's about to leave the building." American trio Nick Watney, Phil Mickelson and Brandt Snedeker will win the bonus money if they are victorious on Sunday. However, Watney is last on five over, while Mickelson and Snedeker are in contention on one under and two under respectively.